The Flash learns the truth of the Forces! The Flash has been trying to find allies in the new Force Avatars. After failing to win favor with Fuerza, Barry found his way to the Sage Force avatar, Psych. After a pretty decent casino heist against criminals, Psych sells Barry out to the thieving couple known as Gemini. 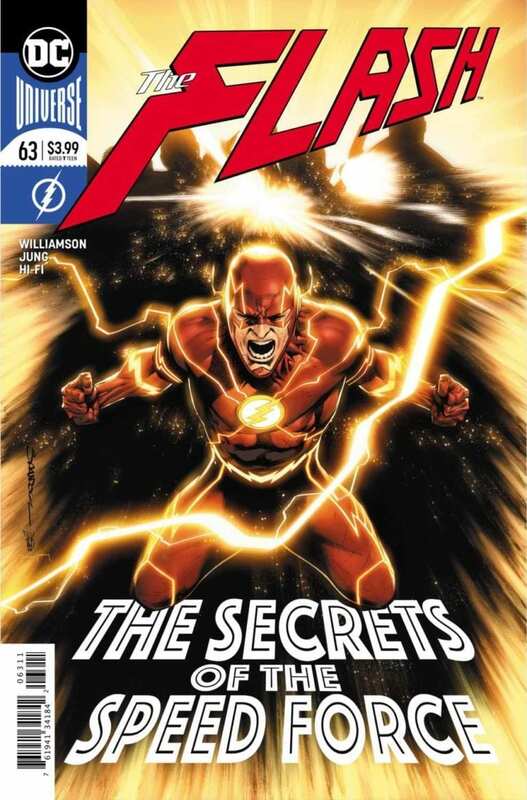 The pair begins to drain Barry of his Speed before draining Psych of his powers. How will the Avatars of Speed and Sage overcome these pair of diabolical lovers? 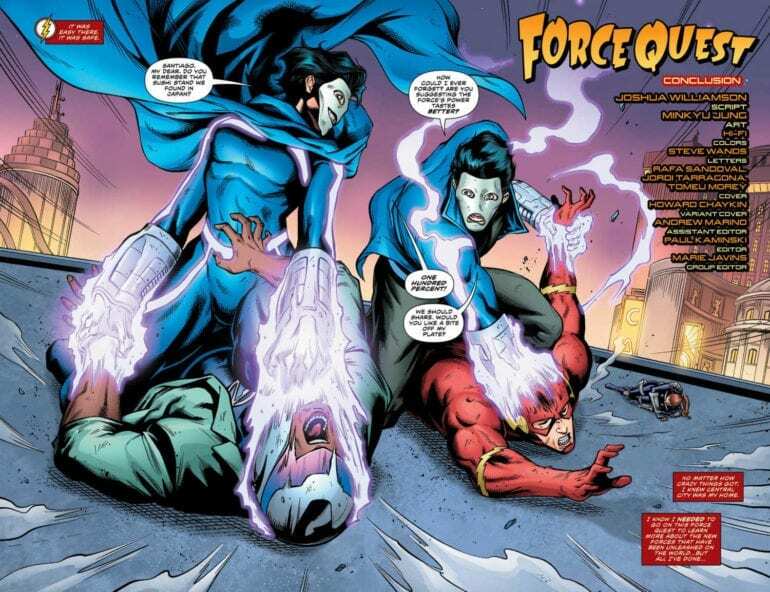 As Gemini continues to absorb Flash and Psych’s forces, they begin to gain their powers. Iris runs in and knocks the pair off them. 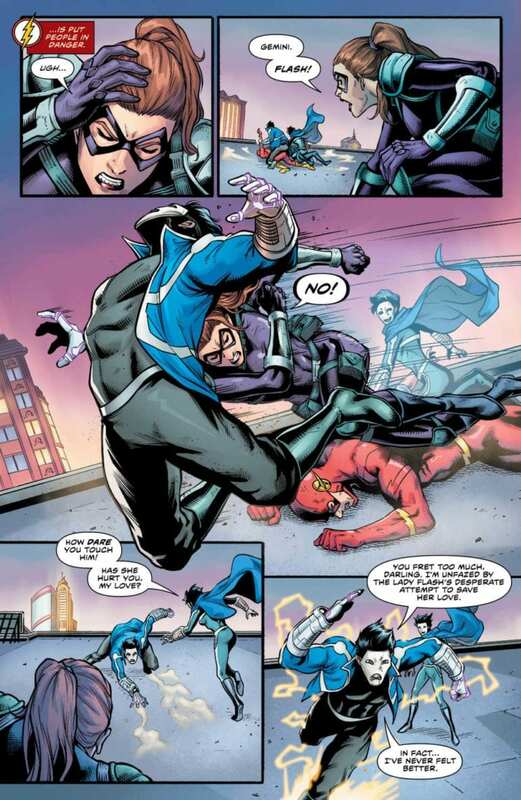 Before Gemini gets a chance to kill her, Flash and Psych put aside their differences and teams up to fight the couple. Unfortunately, Gemini drained them too much and defeated them easily. As they prepare to share a victory kiss, the Sage and Speed Forces within them send them flying apart. The male half alone, Psych uses this opportunity to use his powers to kill him. Flash berates Psych saying if they’re going to work together, he can’t go that far. That’s when Psych reveals the Force users aren’t meant to be a team but fight over a fifth force. This issue bounces from meh to great several times. For every great moment, there was one that fell flat. While the twist of the Force users fighting is excellent, the reveal of the Gorillas hiding the truth is not. It’s plot points like this that drag this issue down. By the end of it, all the pieces are set for a Force War, but how they got there isn’t as exciting as we hope. While I’m excited for the next adventure of the Flash, this ending was subpar. The artist this time around is Minkyu Jung, who grounds us for the final issue of the arc. In previous issues, the art has been ranging from good to strange, especially in the design of the Flash. However, for this finale, Jung keeps the designs simple enough to recognize but with cool action and use of powers. Psych killing the male half of Gemini is dark but cool. It’s a good art style, especially with the colors of Hi-Fi, I just wish it had a better issue to go with it. While I enjoyed the art of this story, this finale didn’t do much for me. There was some cool stand out parts in this issue, but the negatives weigh it down. There’s no doubt this will feel a bit better when the full story is complete. As it stands, however, The Force Quest of the Flash was just a disappointment.